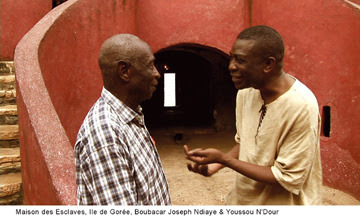 Two African Griots connect Africa and the World: Youssou N’Dour in “Return to Gorée by Pierre-Yves Borgeau, Sotigui Kouyaté in Names Live Nowhere by Dominique Loreau and Sotigui, a Modern Griot by Mahamat-Saleh Haroun. DVD also includes Youssou N’Dour’s live concert performance on Gorée Island. A musical road movie, RETURN TO GOREE follows Senegalese singer Youssou N'Dour's historical journey tracing the trail left by slaves and the jazz music they invented. Youssou N'Dour's challenge is to bring back to Africa a jazz repertoire of his own songs to perform a concert in Goree, the island that today symbolizes the slave trade and stands to honor its victims. With Youssou N'Dour, Moncef Genoud, Joseph Ndiaye, Idris Muhammad, and Amiri Baraka among others. DVD includes filmed final concert on the Goree Island. Luxembourg, 2006, 108 min. / 52min. In English and French with English subtitles. In NAMES LIVE NOWHERE (Les Noms N'Habitent Nulle Part) - whose title is a Senegalese proverb - a griot (story teller) traveling from Dakar to Brussels weaves a tale about African expatriates and offers a candid look at the life of African immigrants in Belgium. With Sotigui Kouyate - a real life griot - as the story teller. SOTIGUI KOUYATE, A MODERN GRIOT dresses the portrait of one of Africa's greatest actor (1936-2010). From Africa to Europe, the film unveils the multiple facets of Sotigui Kouyate, actor, musician and modern griot. NAMES LIVE NOWHERE / A MODERN GRIOT, Dominique Loreau / Mahamat-Saleh Haroun, Belgium/ France, 1994 / 1996, 76min / 58min. In French with English subtitles.